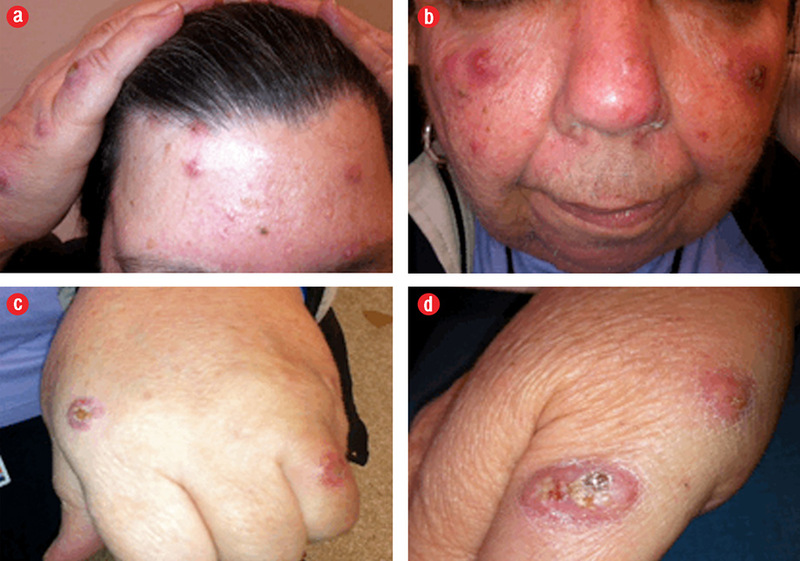 A62-year-old female presented with a three-day history of painful purple-red nodules on her face and extremities [Figure 1] associated with generalized malaise and arthralgia. The patient had a significant medical history of monoclonal gammopathy of undetermined significance diagnosed in 2008, ovarian cancer, which was treated with surgery and chemotherapy in 2010, and thyroid cancer for which she underwent a thyroidectomy in 2011. Figure 1: Erythematous, tender nodules, and papules, some with central crusting distributed asymmetrically over the face, dorsum hands, arms, and thighs. Laboratory investigations showed normal complete blood counts, high C-reactive protein levels (27.4 mg/L; normal range 0–5 mg/L), normal renal and liver function, normal CA 125 level, and normal bone marrow biopsy. Serum protein electrophoresis showed monoclonal immunoglobulin (Ig)-A with lambda peak. A skin biopsy revealed diffuse neutrophilic dermatitis with no evidence of vasculitis or stainable microorganisms. Is there any association between monoclonal gammopathy of undetermined significance and this condition? What is the first-line treatment? Yes. There are few case reports describing the associations between monoclonal gammopathy of undetermined significance and sweet’s syndrome. The gold standard treatment is the use of systemic corticosteroids. Other first-line oral systemic agents are potassium iodide and colchicine. Second-line oral systemic agents include indomethacin, clofazimine, ciclosporin, and dapsone. Sweet’s syndrome has been reported in association with monoclonal gammopathy of undetermined significance (MGUS) and multiple myeloma.4 MGUS is defined as a serum M protein level of less than 3 g/dL, less than 10% clonal plasma cells in the bone marrow, and the absence of end-organ damage.5 MGUS may progress to multiple myeloma, amyloid light-chain (AL) amyloidosis, Waldenström macroglobulinemia, or lymphoma. It is recommended to include immunoelectrophoresis to be part of the work-up of all patients with Sweet’s syndrome because of the high association with malignancy, in particular, hematologic diseases, and the fatal outcome in some of the reported cases. Cohen PR. Sweet’s syndrome–a comprehensive review of an acute febrile neutrophilic dermatosis. Orphanet J Rare Dis 2007;2:34. Cohen PR, Holder WR, Tucker SB, Kono S, Kurzrock R. Sweet syndrome in patients with solid tumors. Cancer. 1993;72(9):2723-2731. Raza S, Kirkland RS, Patel AA, Shortridge JR, Freter C. Insight into Sweet’s syndrome and associated-malignancy: a review of the current literature. Int J Oncol 2013 May;42(5):1516-1522. Daoud MS, Lust JA, Kyle RA, Pittelkow MR. Monoclonal gammopathies and associated skin disorders. J Am Acad Dermatol 1999 Apr;40(4):507-535, quiz 536-538. Kyle RA, Buadi F, Rajkumar SV. Management of monoclonal gammopathy of undetermined significance (MGUS) and smoldering multiple myeloma (SMM). Oncology (Williston Park) 2011 Jun;25(7):578-586. Cohen PR, Kurzrock R. Sweet’s syndrome: a review of current treatment options. Am J Clin Dermatol 2002;3(2):117-131.